The shimmering golden cape-like vestment worn by Cardinal James Gibbons in 1884 is one of several rare and historic liturgical garments now on display at the Basilica of the National Shrine of the Assumption of the Blessed Virgin Mary in Baltimore. Known as a cope, Cardinal Gibbons’ ornate vestment features intricate patterns of hand-stitched leaves interwoven with golden beads. It is accompanied by a “fiddleback” chasuble, a poncho-like garment that takes its nickname from its distinctive shape. Cardinal Gibbons wore the regal vestments during the Third Plenary Council, a meeting of U.S. bishops held in the same basilica where the garments are now on display. 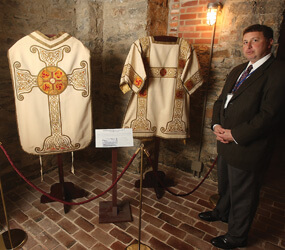 Mark Potter, executive director of the Basilica of the Assumption Historic Trust, noted that all the vestments in the exhibit were made prior to the Second Vatican Council. Many of them were discovered when the basilica was undergoing a restoration several years ago. The vestments were found in boxes and many were left sitting on large garment racks, he said. With the reopening of the basilica, the vestments were relocated to a secure location and stored on a better clothing rack. The exhibit includes a set of Irish poplin vestments given to Archbishop Michael J. Curley by the bishop and clergy of the Diocese of Ardagh and Clonmacnoise in Ireland. They feature hand-stitched Celtic designs. A red-buttoned black cassock believed to have belonged to Cardinal Lawrence Shehan is another item on display, along with vestments with colorful hand-painted flowers. The “Sacred Stitches” exhibit is located in the temporary exhibition area of the basilica’s undercroft and is open during normal basilica hours, 8:30 a.m.-4:30 p.m. (excluding Mass times on Sunday). The free display runs until Sept. 27. Visit www.baltimorebasilica.org for more information.